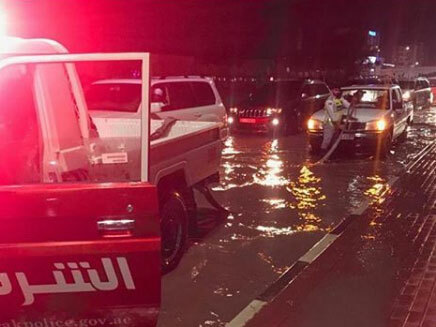 Dubai: Residents in Ras Al Khaimah on Monday extended their gratitude to the police who spent the entire night pulling out vehicles from flooded roads and valleys. Thunderstorms and heavy rainfall hit the northern emirates on Sunday night and into the early hours of Monday morning, wreaking havoc across the roads of Ras Al Khaimah and Umm Al Quwain. Police spared no effort in rescuing the vehicles of motorists, which were left stuck in the middle of the road as the downpour continued to fill all major routes with water. Officers also pushed stalled cars to the curb in a bid to clear a safe path, and accompanied affected motorists the entire night as authorities diligently worked in rescuing their vehicles. On the Instagram account of Ras Al Khaimah Police, a photo of Sunday night’s ordeal was posted online, accompanied with the caption: “Throughout the night, police exerted their efforts to rescue people who were stranded in the middle of the valleys. The directorate of traffic and patrols deployed officers to most of the roads in the emirate to help members of the community”.